Rebels continue onslaught by capturing key Quneitra mountain solidifying control; clashes in Lebanon push Hezbollah from border. Syrian rebels strengthened their hold of the Syrian side of the Golan Heights on Tuesday morning, conquering the mountain Al-Mal in the Quneitra region where they have recently been capturing control from Syrian President Bashar Assad's forces. In conquering the strategic point on Tuesday, rebel forces killed roughly ten Syrian soldiers according to Arab news sources cited by Walla!, with some reports assessing that all of Assad's forces in the area were killed in the clash. It also means Syrian rebels have essentially taken control of all of Assad's bases in the Syrian Golan Heights since starting their conquest of the region around two weeks ago. During the campaign they also took captive 45 UN peacekeepers from Fiji who were abducted by Al Qaeda-linked Al-Nusra Front rebel forces. The rebel forces reportedly said the UN soldiers would "stand trial" under sharia (Islamic law). 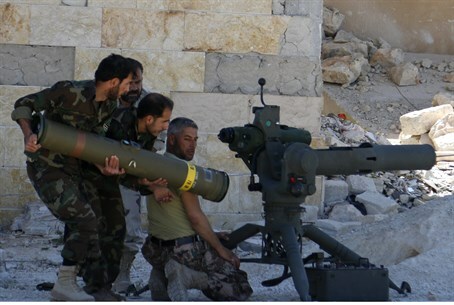 Rebel forces on Monday expanded their control even further, as forces of the Lebanese-based terror group Hezbollah reportedly clashed with Syrian rebels in the Qalmoun mountain region, near the Syrian-Lebanese border in the south of Lebanon. Security sources told the Lebanese Al Mustaqbal paper about the clashes, noting "Hezbollah soldiers were forced to retreat from the area amid night strikes by Assad warplanes in the area." Hezbollah has sent soldiers in the past to aid Assad in Syria, where a Shi'ite axis has been formed between the Iran-proxy terror group, Assad, and Iran. Rebel forces have been encroaching into Lebanese territory as that policy has come home to roost, with the brutal Islamic State (IS, formerly ISIS) recently conquering parts of Lebanon. The Quneitra fighting has also been spilling into Israel, with an IDF soldier wounded on Monday by stray gunfire. Several Israelis have been wounded by errant shells, with the IDF responding to the attacks last week by hitting a Syrian military position after a mortar shell hit the Golan. The incident follows the IDF shooting down a Syrian drone just 24 hours prior to the attack, after it strayed into Israeli airspace.